Even though the weather around here is still winter-like, I’m 100% set on Spring and Summer; I assume we all are, right? Here are some of the latest finds around the web, hope you enjoy them and find something you like! 1. Rebecca Taylor Sleeveless Cotton Midi Dress: Flirty and fun in a lovely coral colour! 2. Free People Sun Valley Jumpsuit: Are you a jumpsuit person? I love them for Summer! 3. J.Crew Flutter-sleeve wrap top in cotton poplin: What a lovely top! Perfect to dress up any look! 4. Steven Greece Slides: Just the fact that they are metallic gold instantly elevates your look! 5. J.Crew Circle Straw Tote: THE type of bag to have for Summer, trust me, you’ll wear it non-stop! 6. Lulu & Georgia Isidora Tassel Throw: This throw comes in many other colours! 7. J.Crew Ruffle Sleeve Eyelet Dress: This gorgeous dress also comes in pink! 8. Zara Embroidered Blouse: Let’s talk about colour, fabric, and cut perfection! I just ordered this top! 9. H&M Embroidered Cotton Top: If you’re looking for a cute top for Summer, this one is $34. 10. Lulu & Georgia Dori Planter and Soleil Planter: Cute planters to have either indoors or outdoors! 11. J.Crew J.Crew Playa printed Venice ruched bikini top and side-tie bottom: Cutest bikini! 12. Topshop by Boutique Cropped Parka: Love this cute jacket to wear on those first transitioning days. 13. Lulu and Georgia Francine Planter: Love this brass planter! 14. J.Crew Slide Sandals in Metallic Rafia and Black and White: Easy slides for Summer! 15. Zara Bucket Bag: This bag looks gorgeous and is under $30!! 17. Madewell The Boardwalk Ankle-Strap Sandal: Because you should own a pair of classic brown and black leather sandals that you can always count on! 19. 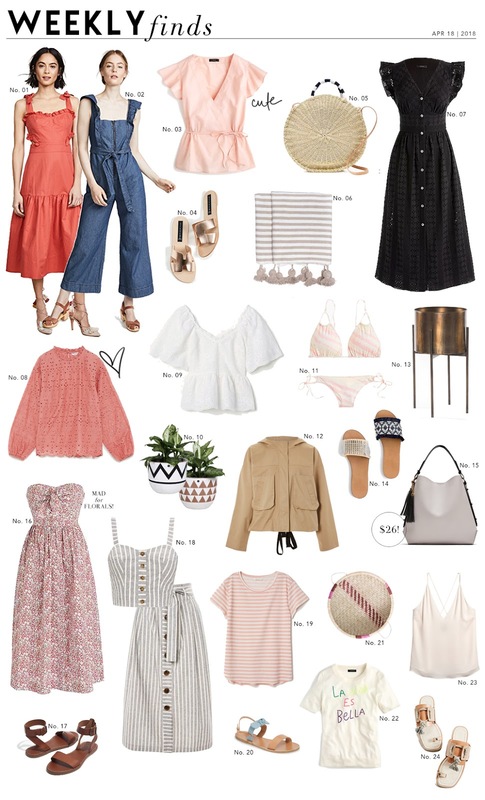 H&M T-Shirt: How to say no to blush stripes, especially when it’s a bargain for just $6! 20. Ancient Greek Clio Bow Sandal: Cute bow detail! 21. Lulu & Georgia Daya Basket: Handwoven in Mozambique! Hang it on a wall for a great statement or place it over a table with other decor items like a plant. 24. Free People Maui Slide Sandals: Aren’t these cool? !